Vitamin C, zinc, copper, manganese and silica are integral collagen and keratin cofactors, promoting skin elasticity. Optimal levels of these nutrients, as well as folate, have been associated with healthy hair, skin and nails. PureWay-C®, a rapidly absorbed enhanced retention vitamin C, supports skin resiliency and helps counter the effects of oxidative stress along with sustained release CoQ10 complex. Niacinamide and zinc promote immune function in the skin. The proanthocyanidins in grape seed extract help to stabilize collagen and elastin by moderating the proteolytic enzymes collagenase and elastase. 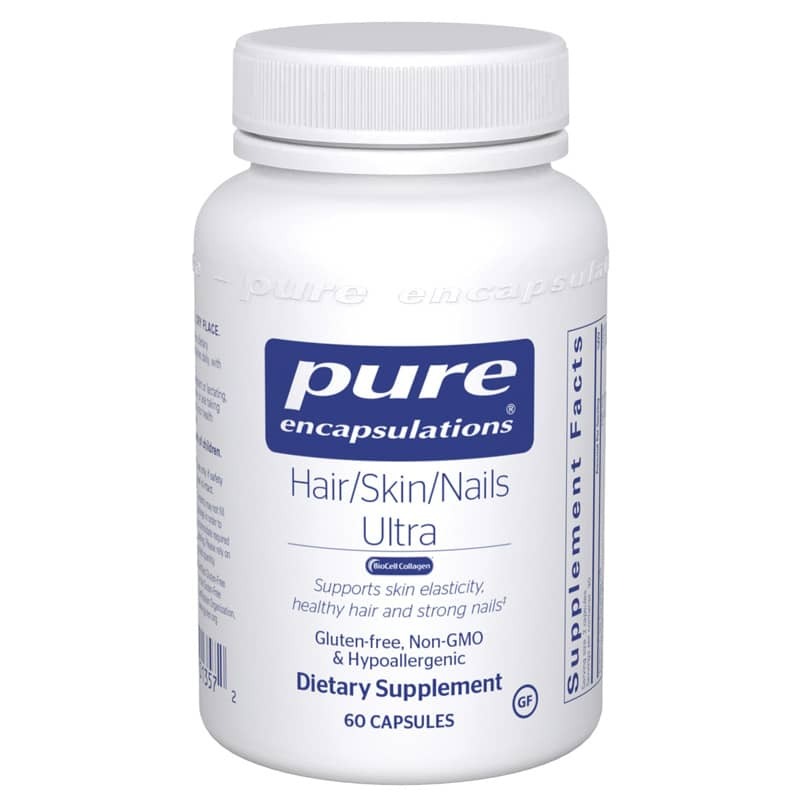 Clinical studies indicate that biotin may help reinforce the keratin structure of the nails, promoting strength and thickness. PABA supports the appearance of healthy hair, through its effects on melanin metabolism. BioCell Collagen. Other Ingredients: maltodextrin, rice bran wax, citrus bioflavonoids, potato starch, ascorbyl palmitate, vegetarian capsule (cellulose, water). Hair Skin Nails Ultra with Metafolin L-5-MTHF SEEMS TO BE A GOOD PRODUCT WILL BUY AGAIN. This was recommended by my pharmacist. I've not noticed evidence of improvement, but will continue to use, as I expect it to take at least six months for results to show.will continue to purchase. Ive been using this the past three weeks and have noticed a big improvement in the thickness of my hair. I have psoriasis and my skin is not as dry as it used to be. I no longer have to put on body lotion twice a day. Excellent service!! Courteous and prompt delivery service. Will order again from the company. I tried many products on market in an attempt to stop my hair loss. Some products did not work at all. The others gave me side effects due to their chemical ingredients. Only this product, that I know, stops hair loss without side effects. I would recommend this product.